This week’s question comes from Mary, a client who is wondering what will happen if she chooses not to obtain health care coverage for 2014. Q. I have been reading about and listening to news coverage regarding the Affordable Care Act and the new health insurance provisions. I am very healthy and, knock on wood, have not had health insurance for the past two years. However, I’ve heard that if I don’t get health care coverage by March 31, 2014, then I’ll be subject to a penalty. Is that accurate? And is there any way around this penalty? A. Great questions, Mary. In fact, you are one of many of our clients that have expressed concerns and/or apprehension about not completely understanding the Affordable Care Act (ACA) and the upcoming provisions that begin January 1st of next year. Let me start by saying that it is true that starting in 2014, you and your family must have adequate health care coverage or you will be facing a penalty, known as the “shared responsibility payment” when you file your 2014 federal income tax return in 2015. As always, however, there are exceptions to every rule. We’ll touch base on those exceptions a little later in our discussion. First, let’s dive a bit deeper into the ACA’s individual shared responsibility provision. The “shared” part of the provisions refers to the fact that our government system, both federal and state, as well as insurers, employers and individuals are given a shared responsibility to take part in this health care reform designed to improve the availability, quality, and affordability of health insurance coverage in the United States. And whether you agree or disagree with the health care reform, this provision calls for each individual to have minimum essential health coverage for each month of that particular calendar year, qualify for an exemption (to be discussed shortly) or pay a penalty with your tax return. The provision applies to individuals of all ages, including children. If you have dependent children that you claim, you are responsible for their coverage or the resultant penalty. As described above, the provision requires minimum essential health coverage for each individual. While the specific details of the coverage requirements are beyond the scope of this particular blog, you should be aware that if you already participate in an employer-sponsored plan, are covered by Medicare or Medicaid, or have some other form of health coverage, your coverage most likely will count as minimum essential coverage and you will not need to do anything other than continue your current coverage to comply with the new requirements. 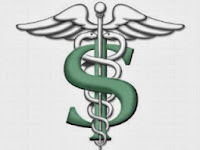 If you are considering purchasing health care coverage through the Health Insurance Marketplace, the exchange can help you find minimum essential coverage that fits your budget and your needs. 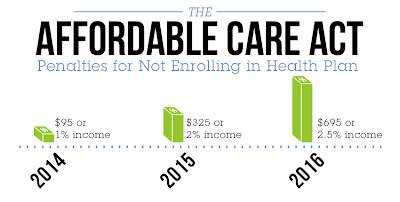 Also, keep in mind that there is transition relief if you are enrolled in a non-calendar year plan. There is also a relief period, known as a short coverage gap, which allows you to have a one-time gap in coverage as long as it lasts less than three months. So, if you are considering swapping plans, you have some leeway in the timing. It is also noteworthy that you will be treated as having minimum essential coverage for a month as long as you have coverage for at least one day during that month. These coverage provisions will be very important in determining the amount of months that you are covered versus not covered when calculating the penalty. So, now that we have some background on the subject, let’s return to Mary’s original question. What happens if you take the risk of not insuring yourself or your family? As we’ve mentioned, you will be subject to a penalty when filing your income tax returns. But is it worth it to pay the penalty versus the cost of health insurance? You may decide that it is. While we certainly cannot advise you on whether or not to make that decision since foregoing insurance can be very risky, especially if you were to become ill, we can certainly help to educate you on the penalty you might face. The penalty, or shared responsibility payment, is a somewhat complicated calculation. In the most basic form, the monthly penalty is the lesser of the national average bronze-level health insurance premium for the taxpayer’s family or an applicable dollar amount. The applicable dollar amount is the greater of a flat dollar amount ($95 in 2014, $325 in 2015, and $695 in 2016 per person, capped at 3 times the amount) or a percentage (1% in 2014, 2% in 2015, 2.5% in 2016) of the taxpayer’s household income over their respective filing threshold. And you thought they might make this easy??? In order for us to estimate your penalty, you’d need to know your household income (the modified adjusted gross income of all relevant members of your family) and the number of months that you were uncovered insurance-wise. The other pieces of information can be obtained from government literature. Let’s look at a very basic example. Suppose Mary is a single individual who decides to waive coverage for the entire 2014 year, meaning she is uncovered for 12 months. Let’s further assume that she has a household income of $120,000, a filing threshold of $12,000 and the national average bronze-level plan premium for an individual is $5,000. Here we go. Since Mary is a single individual, for 2014, her applicable dollar amount is $95 (previous paragraph.) We compare this with the applicable percentage (previous paragraph) of excess household income over her filing threshold ($120,000-12,000 = 108,000 x 1%) or $1,080. We need to use the greater of those two amounts, $1,080. Since our example illustrates that she was uncovered for a full 12 months, we compare this total applicable dollar amount of $1,080, to the full premium for the bronze-level policy given to be $5,000. The lesser of these two amounts will constitute the penalty. So, Mary would owe a penalty of $1,080 when filing her 2014 income tax return. Assuming everything else remained the same in our previous example, suppose Mary was uncovered for 6 months instead of the full year; our calculation changes at the last step. Instead of comparing an applicable dollar amount of $1,080 to a bronze-level premium of $5,000, which were amounts for a full non-covered year, we pro-rate those amounts for the 6 months that she was uncovered. So, in this case, the penalty would be the lesser of $540 ($1,080/12 x 6) or $2,500 ($5,000/12 x 6). Mary’s penalty for being uncovered for 6 months would be $540. While these are extremely simple examples, and there are many factors that can change the course of this calculation, you can see that in 2014, your penalty may not be as high as you might have anticipated. Therefore, you should give careful consideration as to whether the penalty is worth the risk of remaining uninsured. Also, if you have a family, the penalty calculation is even more involved since there are multiple members that may be each differently insured or uninsured. And, as evidenced above by the inflated flat dollar amounts and percentages of excess income, the more time that elapses between when the provisions take place, the higher the penalty will grow. By the time 2016 rolls around, the flat dollar amount will have risen to $695 and we will need to use a 2.5% percent figure in our excess income calculation. Assuming Mary’s entire situation remained the same for the all three years, her uncovered penalty would rise from $1,080 (calculated above for 2014) to $2,160 in 2015 and $2,700 in 2016. Okay, so now that you may be thoroughly confused, although slightly relieved that the penalties are not as considerable as you might have expected, it’s time to highlight some of the ways that you can avoid both having health insurance and having to pay a penalty. There will be exemptions granted for members of religious sects that are recognized as conscientiously opposed to accepting insurance benefits, members of recognized health sharing ministries and members of federally recognized Indian tribes. Exemptions can also be obtained on account of short coverage gap (discussed earlier), hardships that render you unable to obtain coverage, unaffordable coverage options (the minimum premiums are greater than 8 percent of your household income), incarceration, and no U.S. presence. In addition, if your income is below the filing threshold and you are not required to file an income tax return, you are exempt from the essential minimum coverage requirement. For those seeking an exemption, the Health Insurance Marketplace will be able to provide certificates of exemption for many of the exemption categories, although some of these exemptions can be claimed only upon filing a federal income tax return. One final thought to consider when weighing your options. 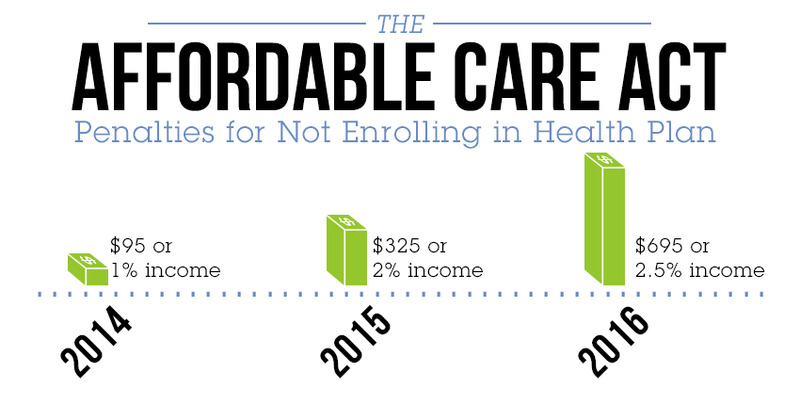 Please keep in mind, that you can obtain health care coverage at any point in time. In other words, if you assume the risk that you will not need health insurance and subsequently fall ill, you will not be precluded from purchasing health insurance when that occurs. There are no pre-existing exclusions with these new policies. You will, however, incur the penalty up until the point in which you obtain coverage. In summary, while the ACA shared responsibility provisions take effect January 1, 2014, many of you will not need to alter your current health care coverage at all to meet the standards. Some of you will choose new health care coverage, while some of you may decide to remain uncovered and face any applicable penalties. If you fall into one of the exempt groups, you should contact the exchange to obtain a certificate of exemption. 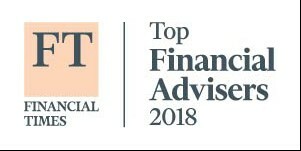 And if you are still undecided and want to explore your options further, we are happy, as always, to provide a complimentary review of your individual financial situation. Thanks again for your well-timed questions, Mary. We encourage our clients and readers to send us questions for our Q&A series at Contact@RollinsFinancial.com. And as always, we hope you will keep Rollins & Associates and Rollins Financial in mind when seeking professional advice on tax matters as well as financial planning and investing. I have intentionally not published a blog since the recent issues surrounding the 2014 fiscal budget and the expansion of the National Debt. I thought it better to wait until the issues were sorted out before I commented on the state of the financial markets. I couldn’t resist using the above title to this blog as it was so reflective of the dramatic (and stupid) demonstration by Senator Ted Cruz, from the great state of Texas, when he attempted unsuccessfully to filibuster the Senate regarding defunding Obamacare. I certainly intend to cover this as well as the importance of the equity markets during the month of September and the first half of October in this blog. However, first, there are other matters I came across recently that I wanted to share with you. By chance, I happened to catch an HBO special titled “Muhammad Ali’s Greatest Fight”. Assuming that the show was a documentary about or tribute to one of the great Muhammad Ali’s boxing matches, I tuned in. Quite interestingly, and to my surprise, the special focused on the Supreme Court case of Muhammad Ali, in 1971, and his application for deferment from the Vietnam draft, citing his conscientious objector status on religious grounds against any type of war. We all know that the case ended in Muhammad Ali’s favor, but the politics behind the decision and the connection to the Supreme Court were extraordinarily interesting to me. This case clearly demonstrated that in many instances, the Supreme Court decides many cases not on judicial or legal precedent, but on personal feelings, political bias, or fear of reprisal by the general public. Therefore, it should not go unnoticed that Ali did not win on the merits of the case, but due to a technicality. Personally, I had not been aware that so much political activity influences the Supreme Court. So, determined to get a better understanding on the matter in order to speak more intelligently on the subject, I noted that much of the HBO show was primarily based upon a 1979 book written by Bob Woodward and Scott Armstrong, titled The Brethren. And, although only about 15 pages in the book were dedicated to this particular case, I found the entire book overwhelmingly interesting. It described the conservative nature of the courts in the 1970’s and the personal idiosyncrasies of the particular justices during that time. I found the book to read completely unbiased toward a specific political agenda, rather simply discussing each case and the background of each decision. It later surfaced after his death that Justice Potter Stewart was actually the inside source of information for the book, since Justice Stewart so highly respected Bob Woodward for his reporting on the Watergate and President Nixon scandals. In order to become further knowledgeable on the subject, I read another book titled, The Nine, by Jeffrey Toobin. This book, written more recently in 2008, also addressed cases and decisions of the Supreme Court, but at a later time when the Supreme Court was migrating from their once conservative roots to a more liberal bias. I found this book also to be interesting and well-written, however, unlike “The Brethren,” it clearly exhibited a liberal bias which appeared to taint its writer. Despite this bias, the book did an excellent job of illustrating the inner-working of the Supreme Court system. Finally, I read a third book, written by Howard L. Bingham and Max Wallace in 2000, on which the HBO special, Muhammad Ali’s Greatest Fight, was based. Different from the other books, this particular novel chronicled Muhammad Ali’s life from childhood through the time he was involved in this particular case. While very little emphasis was given to the mechanisms of the Supreme Court, the book focused on Muhammad Ali, his feelings and the influence the case and its decision had on the boxer himself. I bring this up, not because it has any relevance on economics, the stock market or investing, but as an aside to the political environment and the external pressures on the justices in the Supreme Court. I find that by understanding some of the history and the background behind our court’s major decisions and the magnitude by which these decisions can be impacted by politics, it can shed some light on some of the more current events of our political and judicial systems. I highly recommend these books if you are interested in reading about some of the most influential and important Supreme Court cases and the reasoning behind those case decisions. I promised you in earlier blogs that when Congress discussed the extension of the federal debt limit there would be high volatility in the markets during early October. These predictions were accurate in early October when this occurred in Washington D.C. The President and the two bodies of Congress reminded me of the way children act on a middle school playground, albeit a political arena; among all of the discussions, there was a lot of political fluster, accusations, misinformation, and at the end of the day nothing really happened. Thus, the reason behind why I typically advise investors to ignore the happenings in Washington; over the last 15 years or so, it appears that Congress has little or no effect on the equity markets over the long term financial picture. Unquestionably there are short term variations and volatility, but over the course of time, the economy controls the movement of equity markets, not politics. Since little was accomplished regarding the budget and the extension of the debt, there will now be a new deadline for action by Congress of late January or early February, 2014. So once again, early next year you can expect the same volatility, and most likely the same Congressional outcomes, experienced in October. The only saving grace to us as Americans and investors is if this happens, and Congress fails to do anything in early 2014, the sequester will kick in once again and Congress will be forced to reduce expenditures. It has recently been revealed that over the last two years the federal government has spent less money in each respective “new year” than the previous year. This is the first time that a spending reduction has occurred in subsequent years since the Korean War. Although I am convinced that given the opportunity, spending by both the President and members of Congress would exceed all budgetary limitations, we can be thankful that they can be forced to reduce expenditures under the sequester limitations. Although Congress was able to shut down the government for a few weeks after that embarrassing rendition of Green Eggs and Ham, even that seemingly simple act was screwed up by their ineptness. After the shutdown was over, it was announced that all government employees would receive back-pay for their time off during the furlough and many of those that received unemployment during that time would not be required to pay it back. So basically all that Congress did was provide a two week paid vacation for all government employees as well as an additional kicker of extra compensation. If this is any prediction of how Obamacare will be run then we’re really in trouble, as once again it is has been illustrated that the government does absolutely nothing well. The markets, however, have been nothing short of extraordinary in 2013. As I write this posting on October 22, 2013, the S&P 500 is up 24.42% for the year. The markets held strong for the month of September, a typically very weak month. The S&P 500 was up 3.1%, the NASDAQ composite was up 5.1%, and the DOW Jones industrial average was up 2.3%. Even more unusual, we are deep into the month of October and the markets are trending even higher at this point. Also during the month of September, bond performance resulted in some minor gains and international funds earned decent returns thereby making a historically weak performing month a truly unique one. Due to almost assuredly higher interest rates, I do not anticipate these bond gains to be sustainable in the future although I continue to be encouraged that equity markets will continue to rise over the next few months. In summary, I could write a long dissertation on the progress of the United States economy, but it is sufficient at this point to say things are improving; residential construction is operating at full capacity, employment is marginally up, corporate America is generating profits at record levels, and interest rates continue to remain very low. Although certainly not roaring, the economy continues to make progress and American investors continue to earn welcomed returns. We are approaching the historically strongest time for equity market performance. Between November and April, the equity markets have historically returned the majority of their profits. I look forward to this investment time and can only hope that the upcoming periods add to the positive investment results we have already experienced during 2013. Whether you have been saving for 40 years or 10 years, now is the time to see if a Roth conversion is right for you. 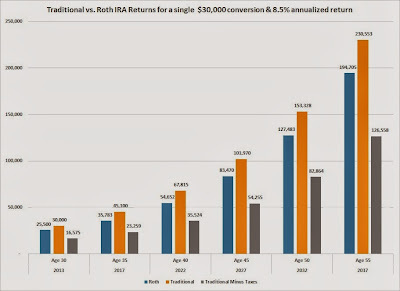 You can convert a variety of retirement accounts to a Roth IRA, depending on the plan and any limitations it might have, a traditional IRA, employer sponsored 401k and some 403b are excellent options. Have you ever wondered if paying taxes on your IRA or 401(k) now would save you money in the future? Do you have a low taxable income this year or next year? Are you retired? If you answer “Yes” to either of these questions, then it might be time to take a look at your retirement accounts. Let’s talk about your income now versus your future income. We all hope we will make more money in the future. For most people this is true. Professionals in their late 30’s to late 40’s should have some retirement savings socked away, and if all goes well, this is the lowest tax bracket they will be in until they retire. For those already on the other side of the retirement fence, you have your Required Minimum Distribution (RMD) and maintaining your standard of living to consider. Believe it or not, these two ends of the saving and spending spectrum are closer than you realize. If you are in your 30’s and 40’s, would you rather pay 15% or 35% on the money have stashed now? Do you want that money you have to grow tax free (in most cases)? For example, let’s say you have $30,000 in your traditional IRA or employer sponsored 401k, tax on that now could be as low as $4,500. One thing to consider is if you do a conversion inside of your employers 401K (if it is allowed) you will have to come up with the funds to pay the taxes with your outside money; this is the conversion that has this requirement. Let that same money grow and have your income increase and that same $30,000 could be worth $127,483 in 20 years and you could be in a 35% tax bracket. The tax on it then would be $44,619!!! You could save $40,119in taxes!! Pay tax now for the benefit of it being 100% tax exempt for the next 30 years along with the appreciation. This seems like a no brainer. Twenty years from now when you are buying that beach house the extra $44,619 would come in handy. For those who have traversed the working years and are now setting out on enjoying the fruits of your labors, let’s make sure you have more fruit. Let’s say you have been responsible in your retirement savings and have a comfortable reserve. You have done the math and know how much you are going to need to cover your current lifestyle going forward. There are several benefits of having dollars in Roth IRAs versus Traditional IRAs. The main benefit is that unlike Traditional IRAs, which grow tax deferred and are then taxed at ordinary income rates upon distribution, Roth IRAs grow tax free and distributions are tax free for federal income tax purposes. A benefit of a Roth IRA that is often overlooked is that it does not necessitate required minimum distributions at age 70½ years of age like a Traditional IRA. As a result, Roth IRAs can be passed down to children, where they will be distributed tax free over the children’s lifetimes. So, regardless if you are in the middle of your career or the beginning of your retirement, a Roth conversion can make the things you want in the future more attainable now. Call us and we can run the numbers and see if it makes sense for you.